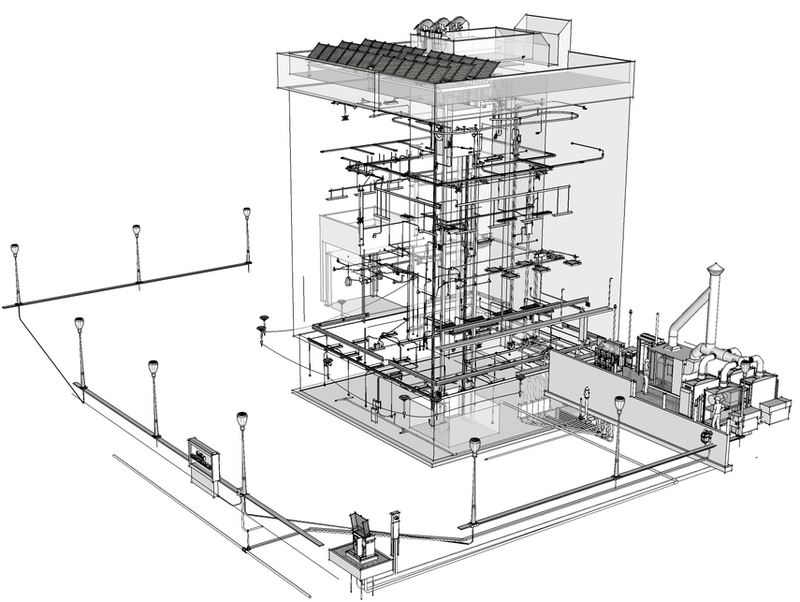 3D construction models begin with a set of 2D contract documents. These are the construction documents that represent the scope of the contract requirements provided by the design team. The model is constructed to confirm a bid, during contract negotiations, or in the field just ahead of the actual work. 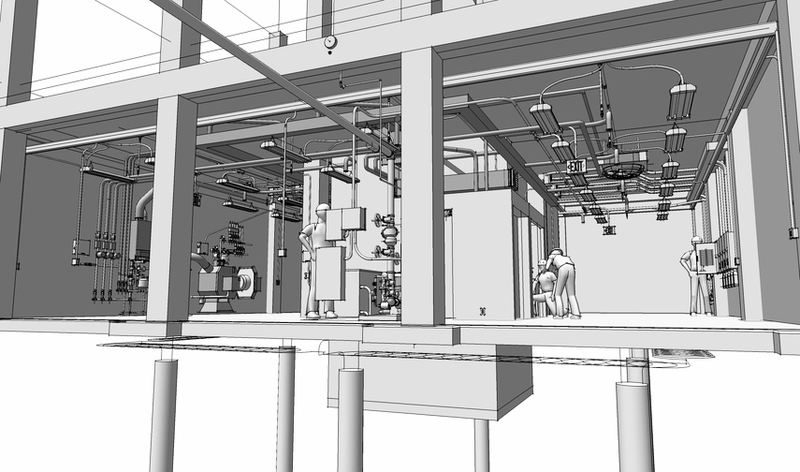 The idea is to use the 3D modeler as a tool to systematically check the 2D documents, test details and dimensions, and understand the assumptions made by the design team — before the documents are used in the field. 1. Start with a site model: this is a scaled scan of the plat map or survey laid over a geographically accurate model base. Use the site model for site utilization planning (SUP), to simulate the impact of weather and sun on construction activities, and to map the regional context of the jobsite. 2. Excavate the building from a workpoint. 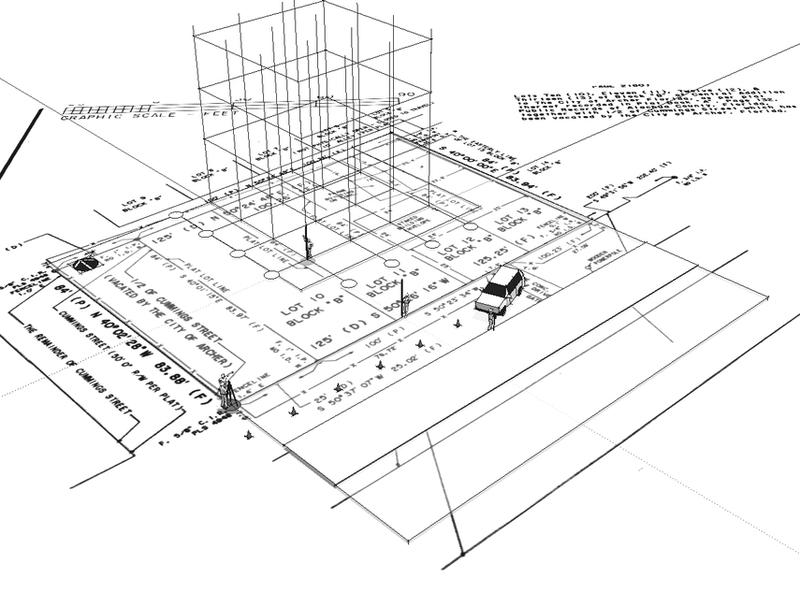 Base cuts, grading, and shoring on the referenced elevations and dimensions shown on the survey and plot plans. 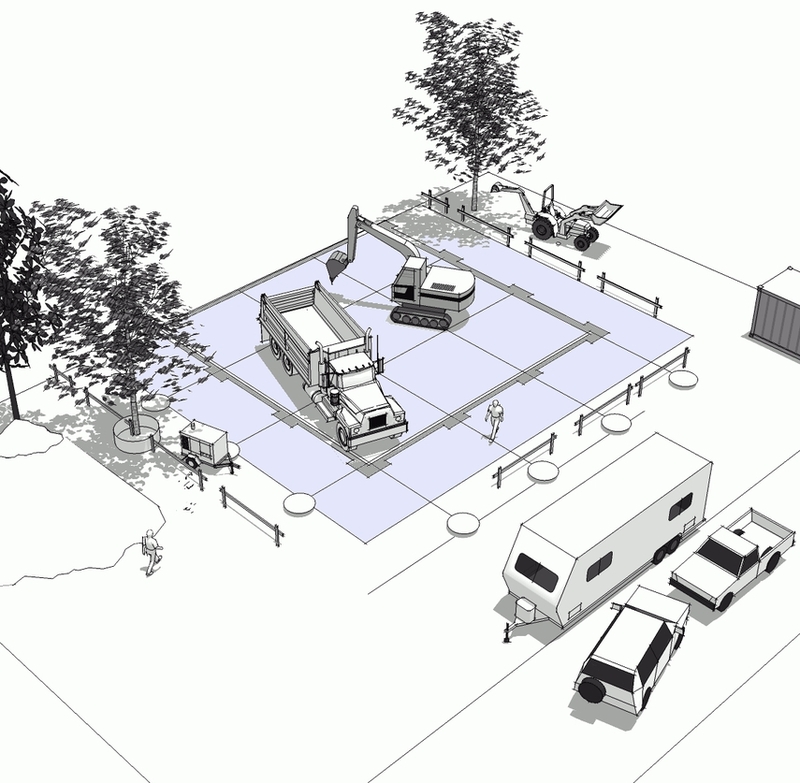 Use scaled equipment models to test available access routes, stockpiles, and staging. 3. Use the 2D documents to begin the foundations (formwork). Set up the scaffolding, falsework, and equipment that will be needed to complete the foundation. Include reinforcing, connectors, and other specialty items shown on the contract documents. The modeling program automatically surveys quantities and identifies phases, tasks, and errors and omissions. 4. Build the structural frame according to the engineered documents. Include staging and lay down area as well as scaled models of the workers, tools, and equipment necessary to complete the framing. The model is built using the sequence and processes anticipated for the construction. Survey quantities are again automatically generated, means and methods are coordinated with field teams, and the resulting model illustrates areas of concern, RFIs, and conflicts. 5. Building systems are installed per plans and specs. Important is to build these systems in the order of their actual construction using scaled models of the tools and equipment needed by each subcontractor. Sequence modeling highlights conflicts, anticipates coordination problems, and tests design assumptions. 6. Finish work follows the contract details. 3D component models are fitted to roofing, curtain and window walls, siding, finishes, cabinetry and furnishings. The completed model focuses on coordinating processes and sequences necessary to complete the contract obligations. The result is a construction model that details the means, methods, and processes embedded in the contract documents. 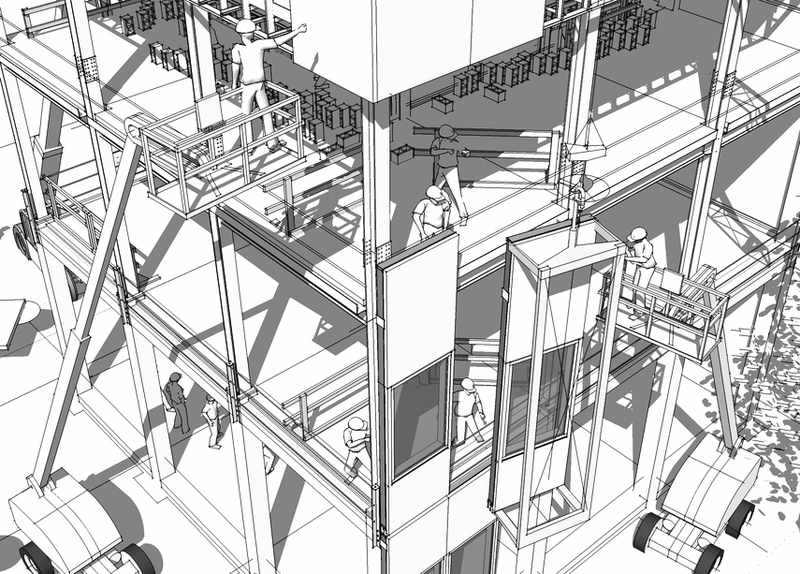 Errors and omissions are identified (often output from a poorly constructed BIM model) and schedule concerns, subcontractor challenges, value engineer alternatives, and real-world conflicts are illustrated for all to see in three-dimensions. One thing to keep in mind is that a construction model is not the same as a building information model (BIM). A construction model graphically communicates the means, methods, and processes found in the production of complex objects. It dynamically represents the sequence of events necessary to build that object. Our books demonstrate the potential of construction models and their ability to graphically communicate construction processes. First using an early versions of AutoCAD (Graphic Communications in Construction, Prentice Hall), then exploring the potential of web-based visual systems (The Web @ Work, Homebuilder Press) and most recently as a series a graphic narratives using SketchUp as a construction modeler. 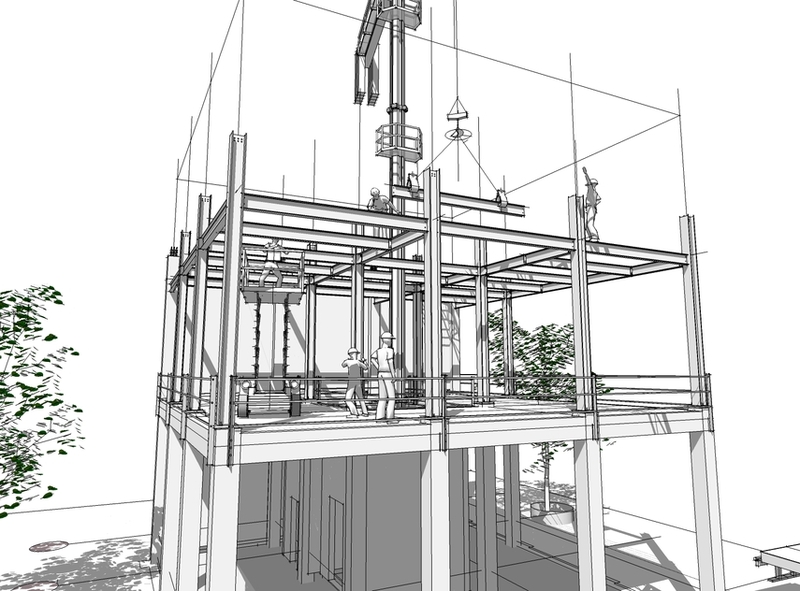 The potential of SketchUp for construction management was first explored at the University of Florida in 2001. SketchUp was used to quickly orient construction management students struggling to learn how to build piece-based models with AutoCAD 2000. That early effort evolved into an advanced construction modeling class and the first book, 3D Construction Modeling: Project Based Learning. This early book broke new ground simply because it was based on the work of several comic and graphic novelists. 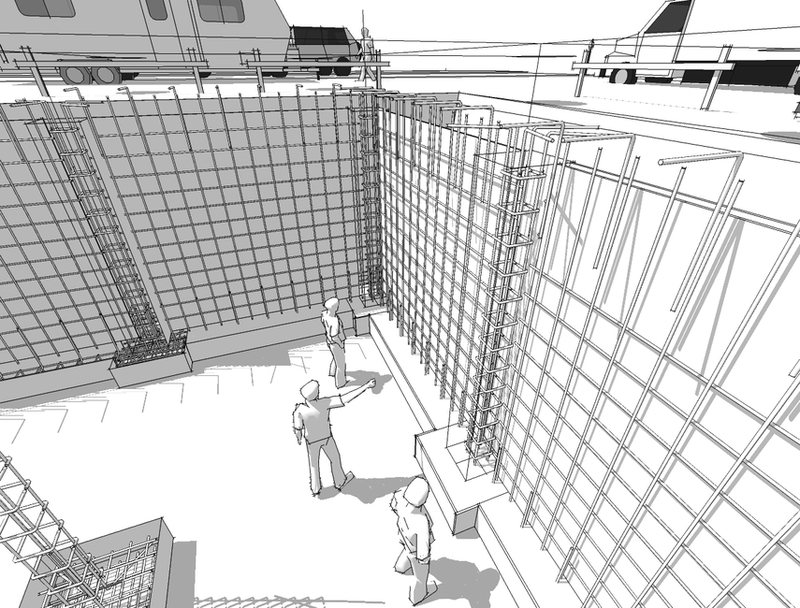 It used SketchUp V4 to explore the format and delivery of construction information on the two dimensional pages of a book. The models are dated, but the book remains popular as a project-based learning tool. Our next book, Living SMALL:The Life of Small Houses, expanded on the lessons learned from both SketchUp and publishing a graphic narrative. Living SMALL uses SketchUp to build 16 small houses. The idea was to mix modeling tutorials with video tours of three-dimensional models to convey some of the traditions of home construction and the values of small house construction. The 16 models also tested different organizational structures for the models and hinted at the potential of SketchUp as a construction modeler. The results can be seen in our next book, Building SIMPLE: Building and Information Model. This book used many of the new features found in SketchUp V5 to explore the organization of a large construction model and communicates the production of a mid-rise office building. The models with this book were the first to be “outlined” with V5’s Outliner feature and the first to communicate real-world construction as a sequence of collaborative events. The models and illustrations from this book are now used internationally to illustrate and explain construction methods. These values were continued in our next book, Being SUSTAINABLE: Building Systems Performance. Construction models in this book were built using Google SketchUp. The book, models, and video tutorials illustrate the mechanics of sustainability in the same mid-rise office building found in Building SIMPLE. 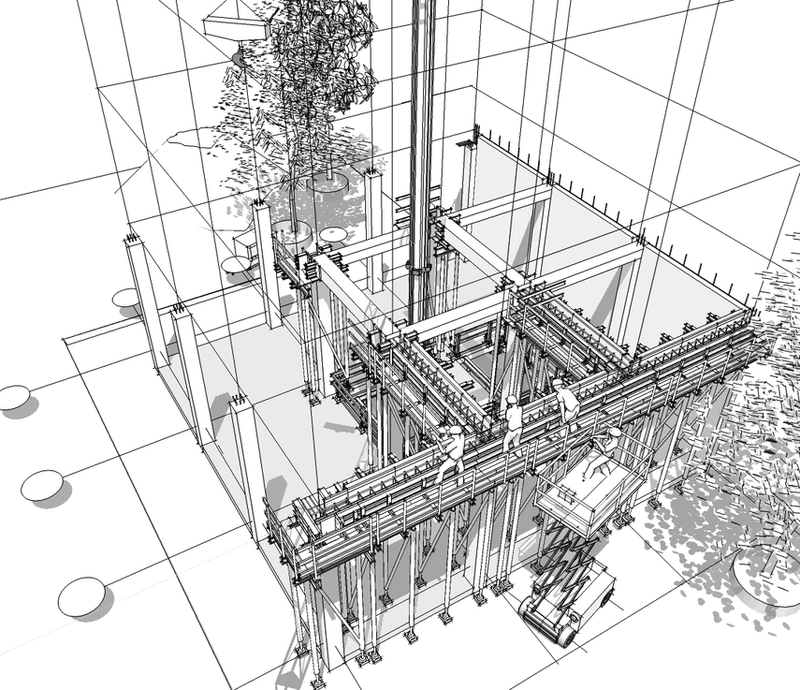 The models push the limits of construction modeling in SketchUp and the real potential of three-dimensional modeling to illustrate complex systems. The value of the book is that it illustrates the collaborative promise of SketchUp and construction modeling to bridge the information gaps often found in the real-world when dealing with complex building systems. 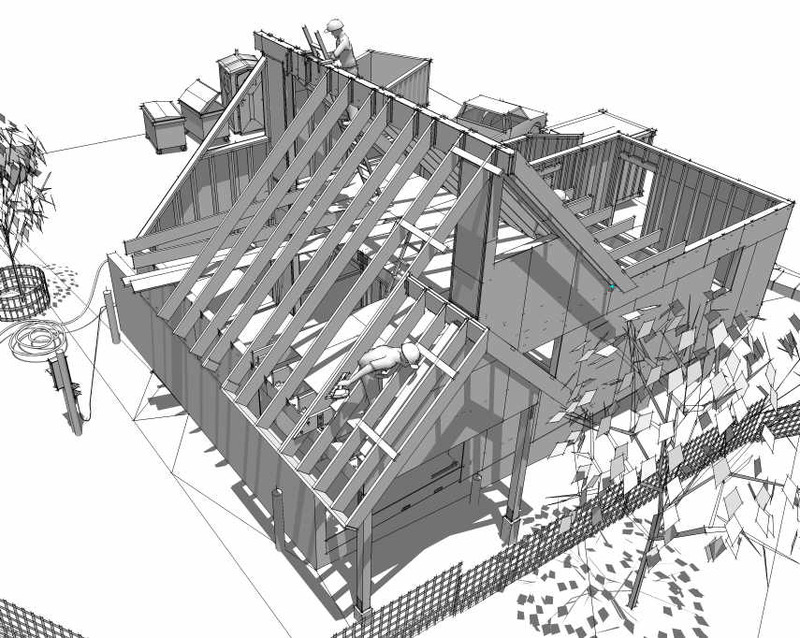 We’ve also used SketchUp to publish assembly manuals, forensic models, and fabrication models for management consultants, contractors, and manufacturers and are working on a new book using SketchUp to illustrate every detail in the construction of a wood frame house, How a House is Built: With 3D Construction Models. This book is also an updated project-based learning tool on how-to-build construction models with SketchUp. The goal is to improve construction communications. The objective is to make complex construction information quick to read and easy to understand. With these books, we’ve found that very complex construction models can be built using a simple three-dimensional construction modeler called SketchUp. And the best thing about SketchUp is that it is free.